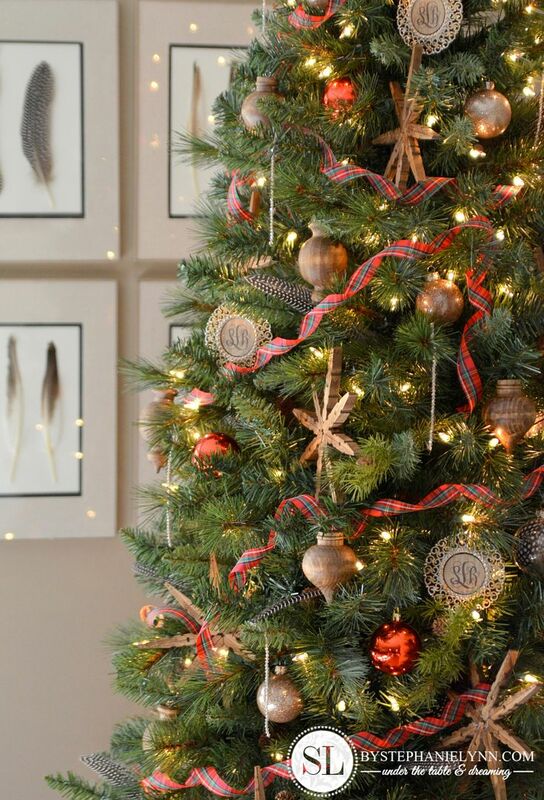 Easy Holiday Ornament Ideas – Michaels Dream Tree Challenge #JustAddMichaels |I’m back today to share all of the details for my Michaels Dream Tree I revealed a few days ago. All of the ornaments used on the tree were purchased right at my local Michaels Store and are incredibly easy to put together. I had so much fun not only decorating the tree, but getting a little crafting time in as well, putting all of the ornaments together. One huge advantage of planning out a tree so early in the season was the extra time it allowed to put together some crafty ornaments. After Thanksgiving, the days just seem to fly by and sitting down to make a trees worth of projects just does not make the list. So that is one thing I really did enjoy throughout this challenge. These ideas are really simple, any one can re-create them, and they even make great crafts to get the little ones involved with. All of them can be customized to match any theme or color scheme – plus they are inexpensive as well! 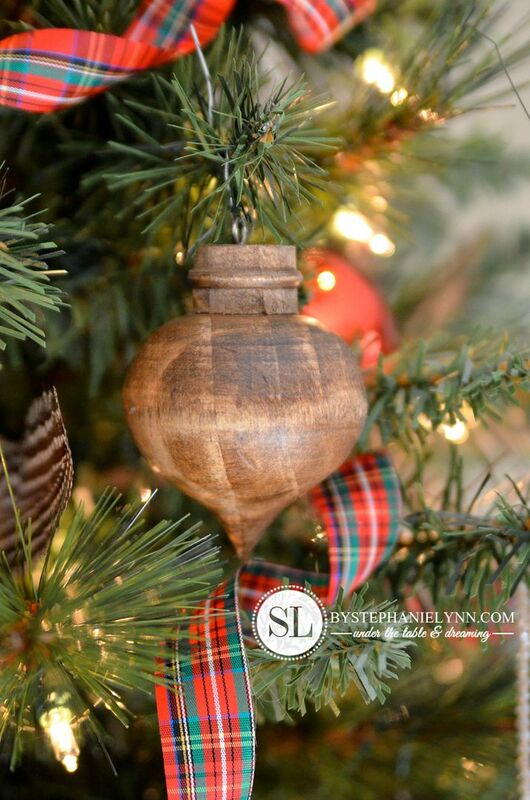 These unstained natural wooden ornaments were the first thing that caught my eye. I have seen some high end retailers sell them in finished sets for $40 and up. Michaels sells an unfinished version in five different shapes for around $2 a piece – however they are always running holiday sales this time of year. I was able to pick them up for 40% off. 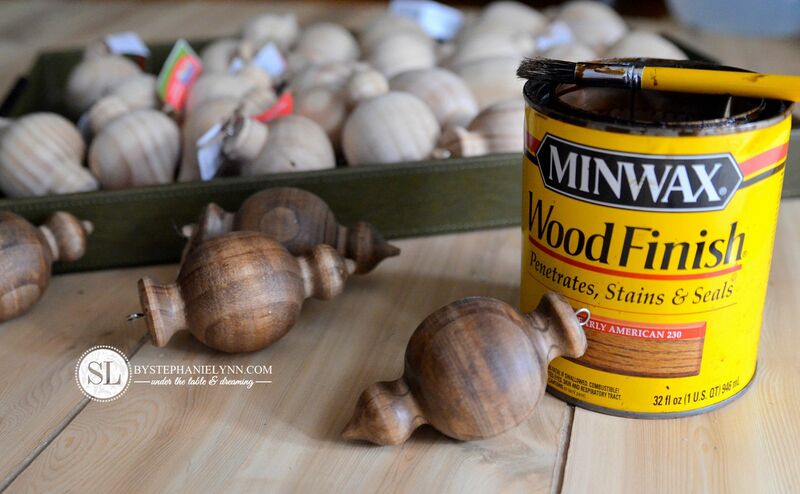 I simply brushed on Minwax Early American Wood Stain , let it sit for a minute, then wiped down each ornament with a cotton cloth. For a shiny finish, a finishing wax can then be applied – though I just left them as is. 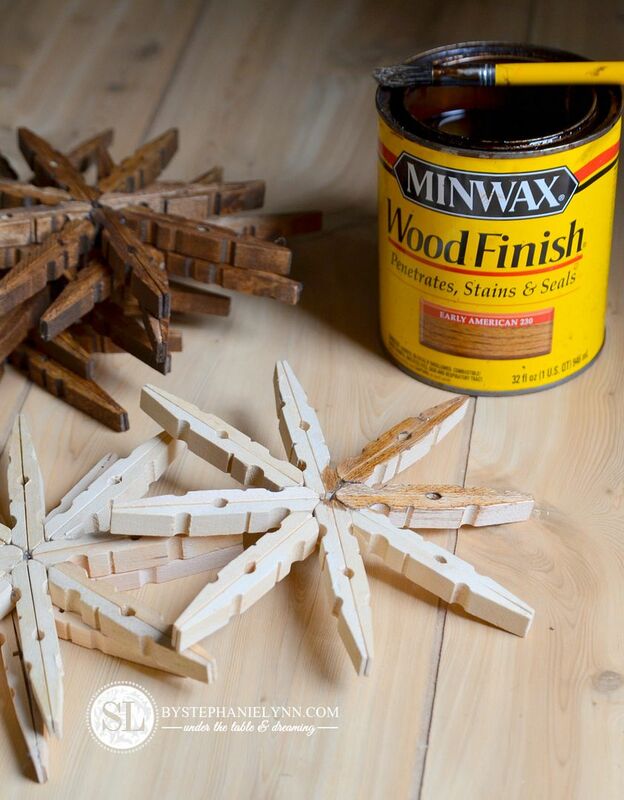 To carry out the natural wooden theme I made some wooden clothespin snowflake ornaments for the tree as well. I made these a couple of years ago and used them as gift toppers. They are super easy to make and require just eight wooden clothespins each and some hot glue. 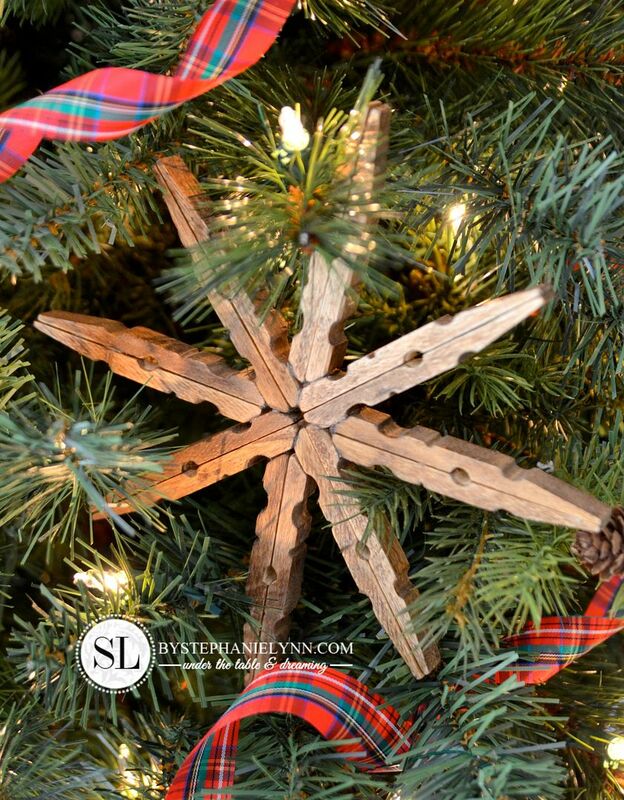 The full step by step tutorial can be found here: Clothespin Snowflake Ornaments. Instead of painting them, like I did for the gift toppers, I stained these using the same Minwax Wood Stain as above. I also made a tree topper by adding another round of clothespins to one of the snowflakes. 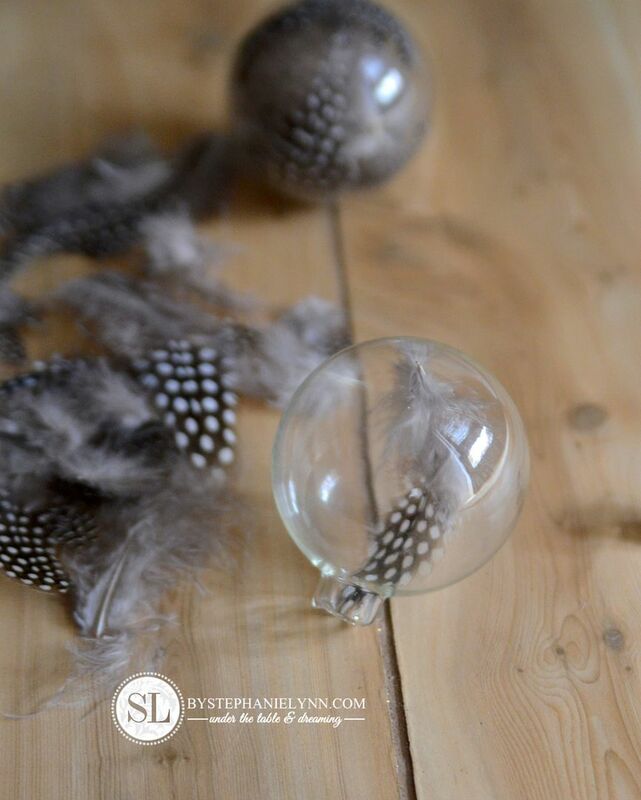 The next ornament is another remake of a tutorial I shared a couple years ago using clear glass ornaments and feathers. I originally made the ornaments with a simple monogram to use for our christmas table placecards. This time around I used black and white guinea feathers found in the craft aisles of Michaels – $2.99 a pack. The clear glass ornaments also came from Michaels in the holiday section. 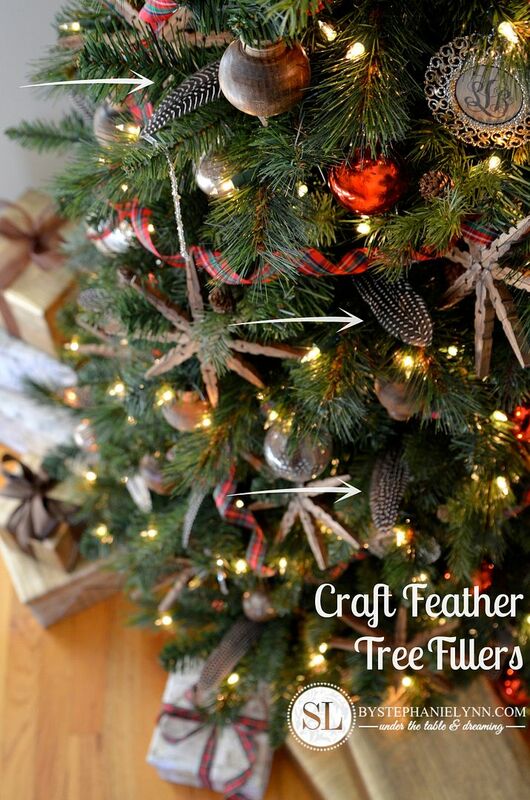 The process is pretty self explanatory – though, the orginal step by step tutorial can be found here: Handmade Monogram Feather Ornaments. 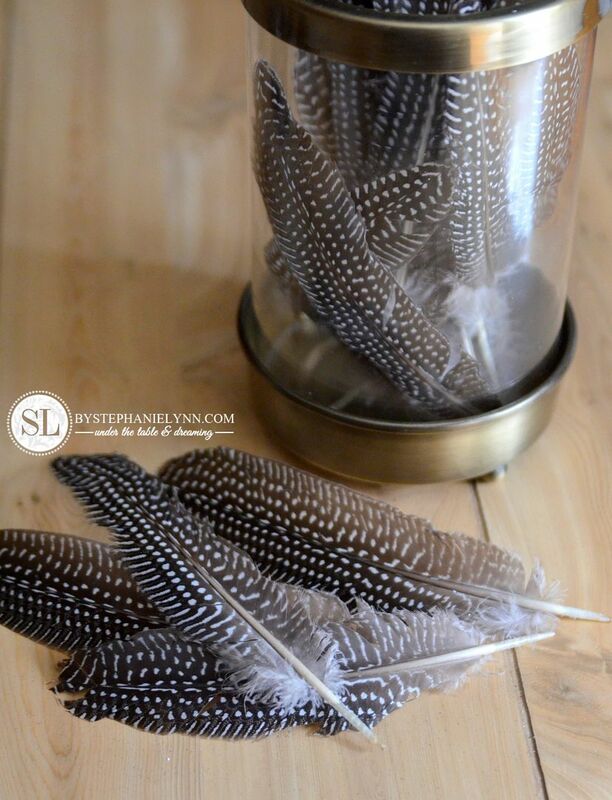 These longer guinea feathers were also found in the craft aisle. 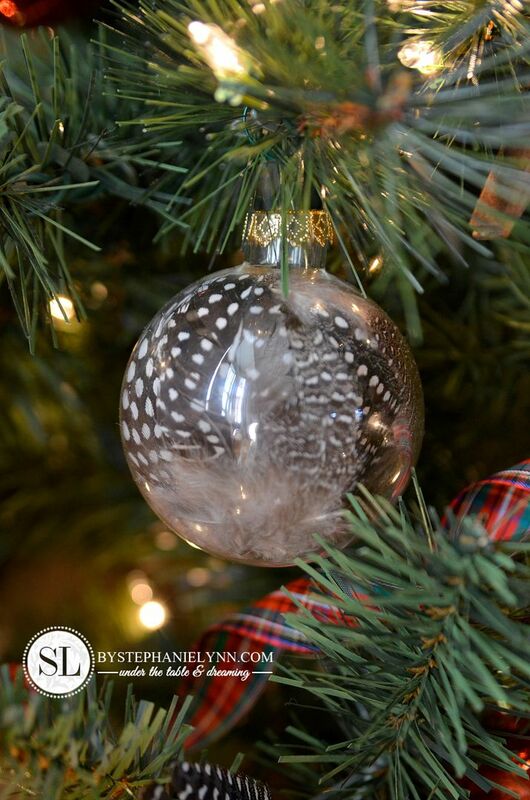 I really liked the black and white polka dots and used them as fillers throughout the tree. To add some sparkle to the tree I made these glitter filled glass ornaments. They are definitely one of my favorites as the glitter is so bright and vibrant underneath the glass. They are incredibly easy to put together and can be made to custom match any color theme you have going on your tree. 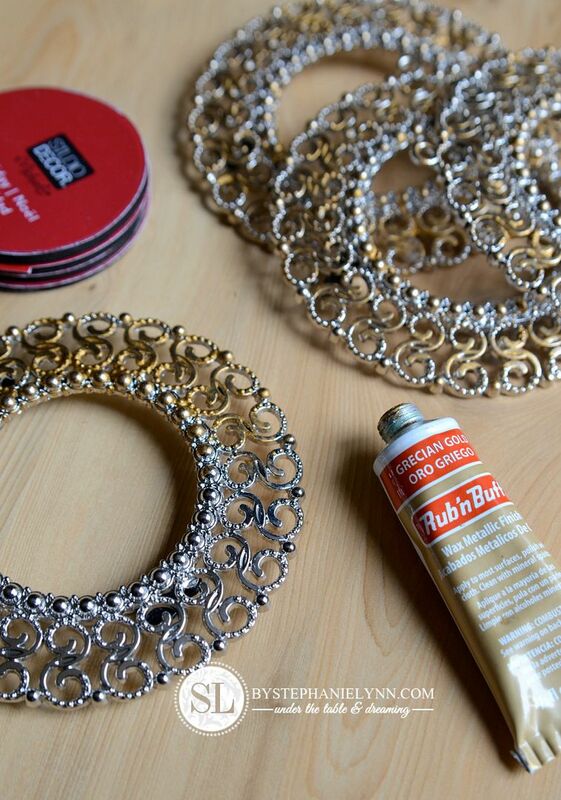 Begin with a couple packs of inexpensive clear glass ornaments and remove the metal caps. 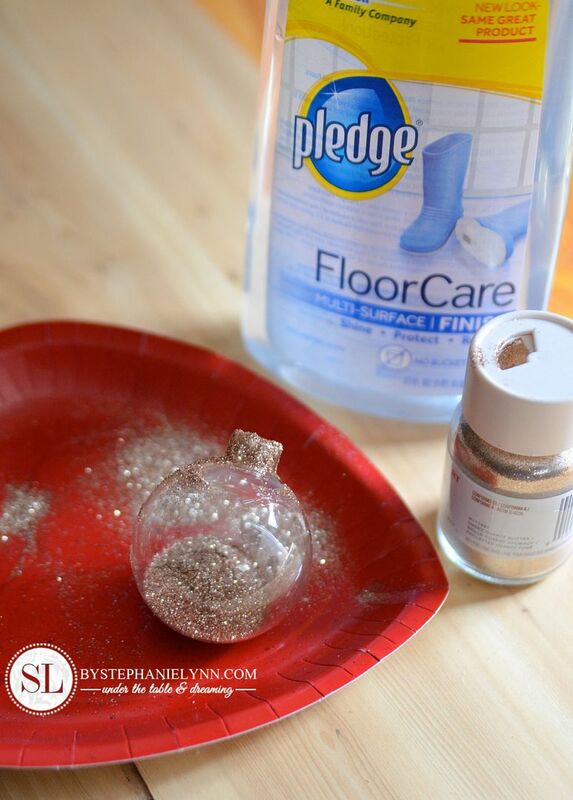 Carefully squirt in a fair amount of Pledge Multi-Surface Floor Care and gently swirl the ornament until the entire inside is coated with the Pledge. Pour the excess Pledge back into the container – I simply unscrewed the top on the Pledge and placed the ornament upside down on the top of the bottle to drain the excess. Next pour a good amount of glitter directly in the ornament. 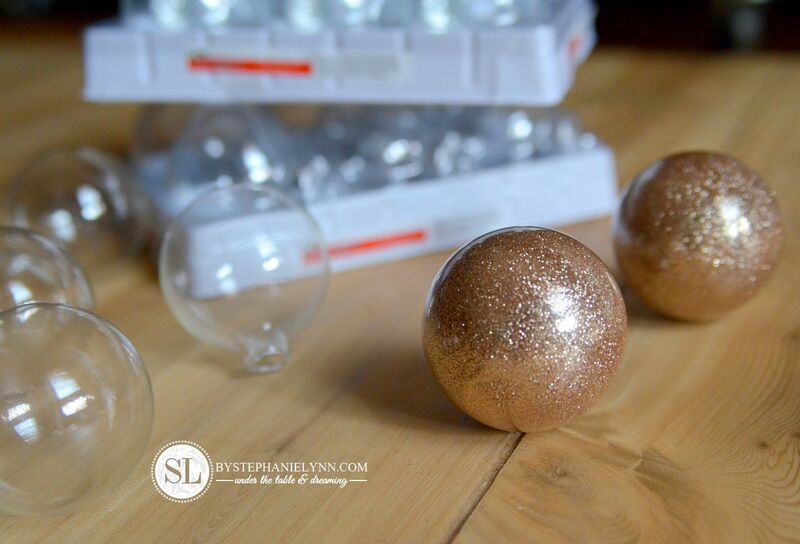 Gently roll the ornament around – coating the entire inside with glitter. 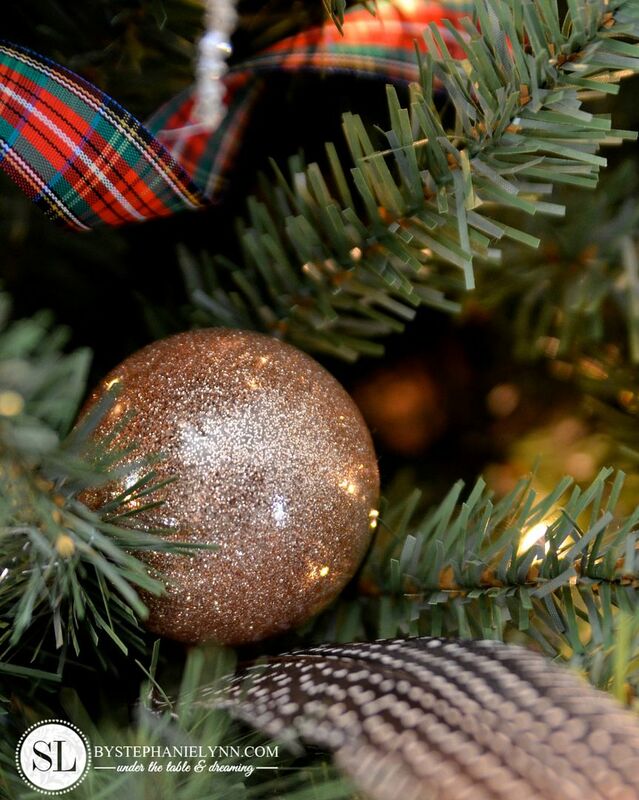 Turn the ornament upside down and gently tap out the excess glitter onto a paper plate. The paper plate allows you to pour the extra glitter back into the container. As the Pledge dries it hardens and seals the glitter. There is no need to wait though, as they can be hung immediately. The sparkle and shine is simply amazing. I used smokey quartz glitter on these, found in the Martha Stewart section at Michaels. I’m still loving anything with a monogram and wanted to add a few to this year’s tree. I picked up a few of these framed ornaments for $4 a piece – they are from a holiday line display near the Michaels framing section. To tone down the shiny silver I applied some grecian gold Rub’ n Buff by just rubbing a tiny bit on the entire ornament with my fingertip. For the monogram, I found the woodgrain paper in Michaels scrapbooking section (they are sold by the sheet). The sheets are 12X12 so I simply cut them down to fit into my home printer and printed the monograms. A 2 inch circle punch, also found in the scrapbooking section, was then used to punch out the monograms. The frames were then re-assembled using double sided tape to hold the monogram in place. Finally for a little touch of glam, these crystal beads were added. These were incredibly easy and I love the way they sparkle under the lights. 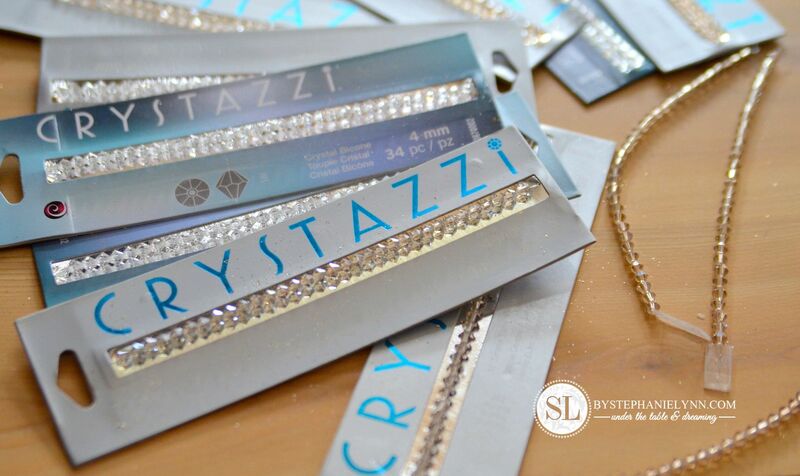 The beads are actually from Michaels jewelry making department and are from Crystazzi – on sale for $2 a pack. They are the 4mm size and come on a piece of clear nylon thread. Instead of re-stringing them – I decided to just carefully removed them from the packaging and use them as is. A piece of clear packaging tape was folded over on end to create a ‘hanger’ – as shown above. When that little piece of tape is turned sideways it can easily be tucked in between the pine branches so it catches and stays in place. Once hung the tape can not be seen – and once the season is over the beads can be re-used for other projects. The past few years we have placed our Christmas Trees in baskets. If you have ever tried to do this you know how unstable the base can become if you are unable to find a large enough basket for the artificial tree base to be fully extended – the tree can become very top heavy. We alternate each year between live trees and artificial so I like to try and keep the baskets to re-use. 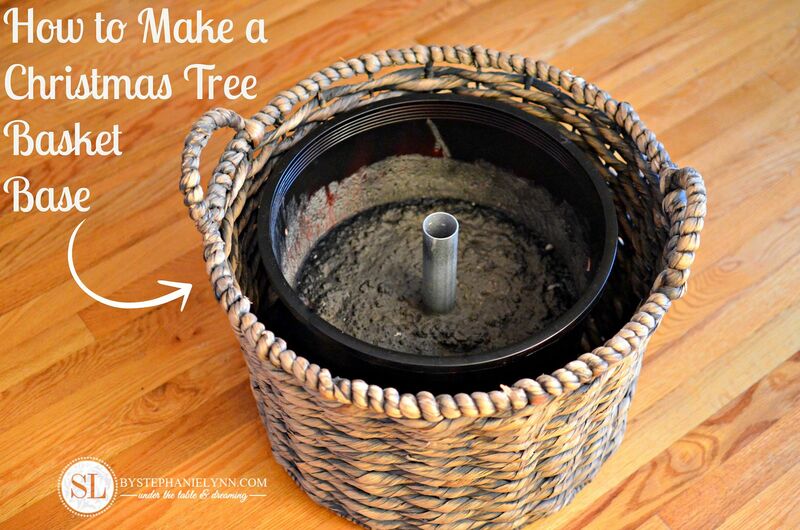 Start with a large plastic pot that fits inside your basket. We simply re-purposed an old pot from the live tree we purchased last year. The plastic pot should fit inside the basket you are using and sit about an inch below the rim. Cover any drainage holes in the pot with duct tape. Set a cut piece of 1 1/4 inch conduit in the center of the pot. Conduit can be found at your local hardware store in the electrical/plumbing section. The ‘stem’ (the part of the tree that goes into the base) is pretty standard so 1 1/4 inch conduit should work – though you should measure just to be sure. Carefully holding the conduit in place, pour 2/3 of a 60 pound bag of Quikcrete Ready-to-Use Concrete (dry mix) in the pot. Add water (according to package directions) and slowly stir to throughly mix. Let sit for 24 -48 hours to cure. The pot will have some weight to it – though that will ensure a sturdy tree once it is placed in the conduit. Hope your inspired to start some holiday crafting! 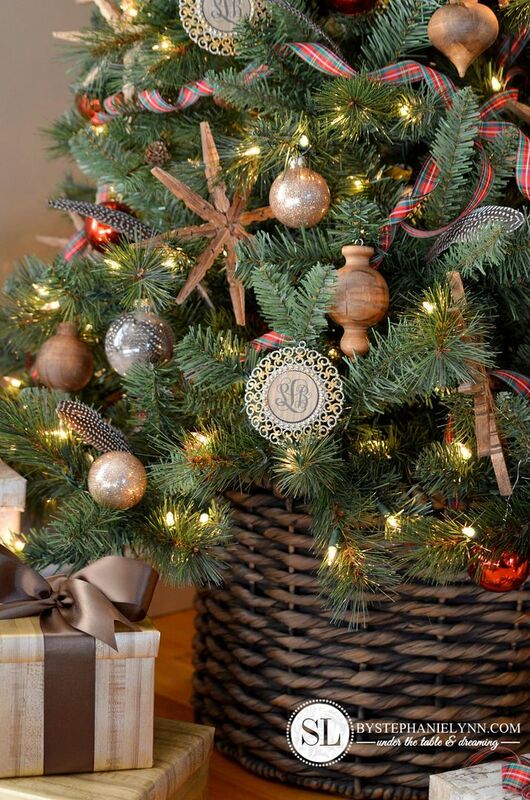 I love the wood ornaments and snowflakes! I finished the ones I made and added a wooden button to the center of them. I posted them on my blog with a link back to your post! You did such a fantastic job with this tree. I LOVE it!!! Thanks for all the tips. How did you get the tartan plaid ribbon to curl so nicely? 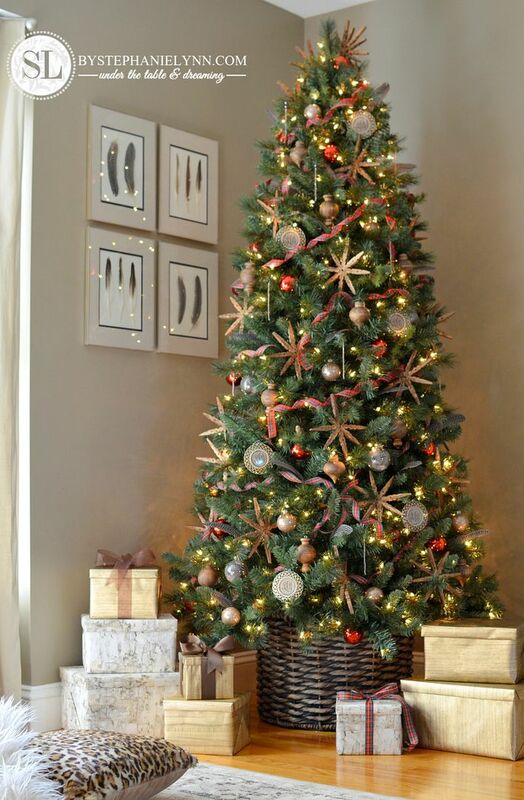 I love the whole look of this tree! Thanks for inspiring me! Wow, I AM inspired! 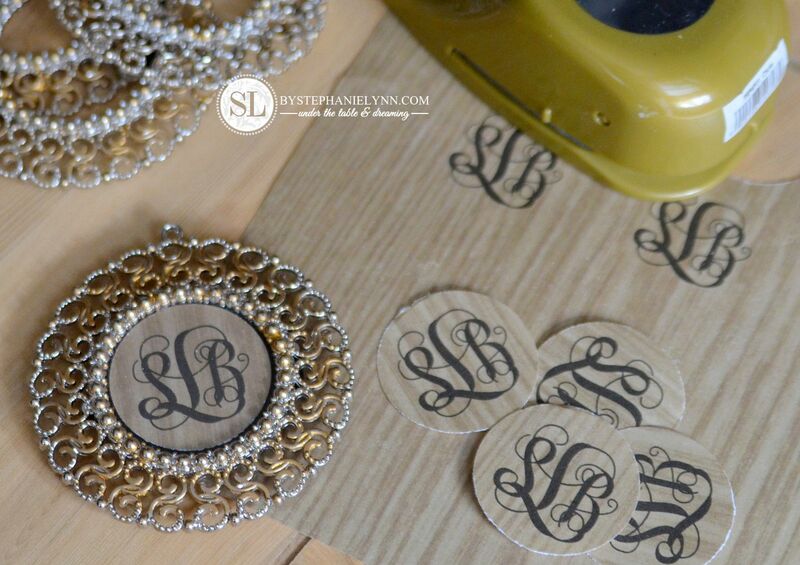 I especially love the monogram ornaments….I just might try those myself! Oh wow !! 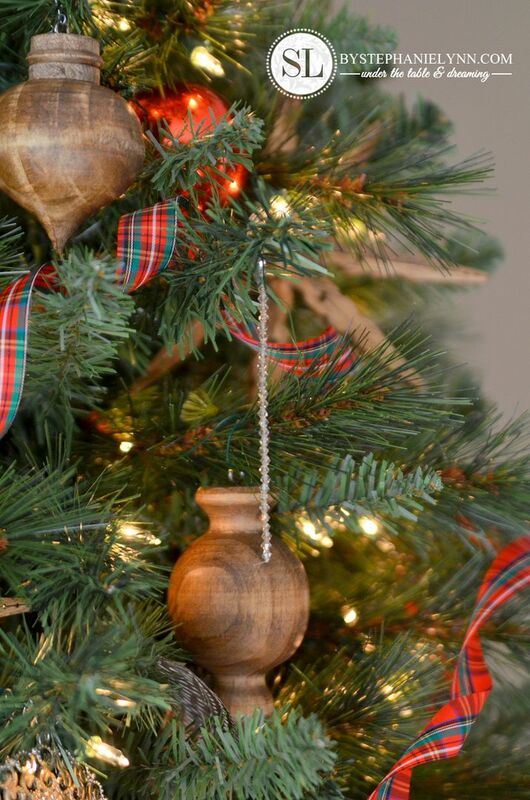 I love these ornaments ~ especially the clothespin ! So darn innovative !!! Why didn’t I think of THAT !! Thank you for sharing all these lovely ornaments. I cannot believe you made all these ornaments. This is one of the most beautiful trees I have ever seen!! 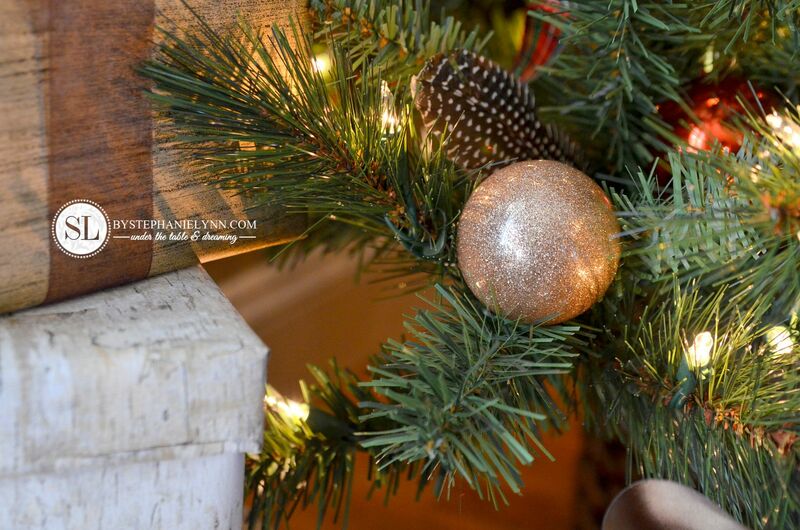 I love the rustic elements paired with the sparkly. It looks amazing!!! Wow! Your tree turned out to be absolutely gorgeous. I really like the stained ornaments. They turned out beautiful! Beautiful!! I love that this is an almost totally handmade tree. All the ornaments are easy to do and I love how it came to together for such a natural almost woodland look. What a great job Stephanie!! I’m wondering about the tree base. Does the tree’s “trunk” fit over the conduit? Oh my, I remember making clothes pin ornaments when I was little. You have brought back memories and rekindled a great Christmas craft to make with my grandson. I made the hanging crystal ornaments this year by buying beads all year long and then buying the cheap, thin ornament hangers from Walmart. I straightened the bottom of the hook and put a small loop on it. Then I threaded the beads on the top loop and I was able to hang them that way. They are pretty and I can actually hook more than two together to get a cascade look. Hi Nicole, This particular basket is 13 inches high and approximately 20 inches in diameter. You have a gorgeous tree! 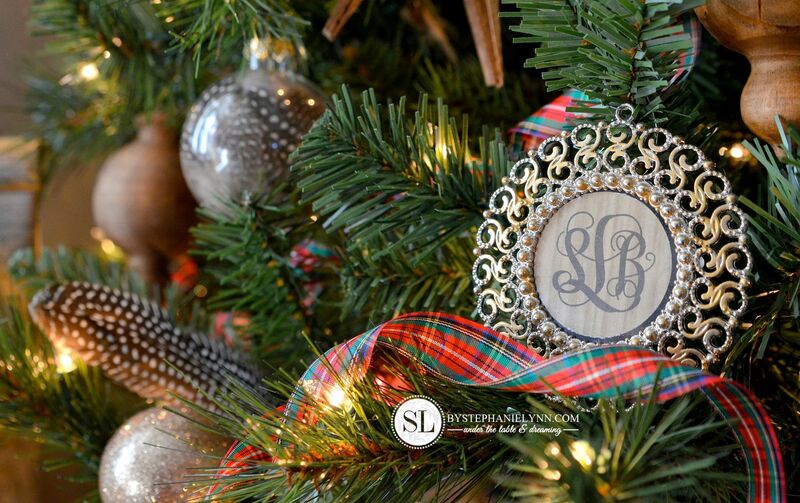 LOVE LOVE the clothes pin ornament, and the monogram frames – thanks for sharing your terrific ideas! Love this tree! Your ornaments are fabulous!